Don’t you love the smell of freshly made popcorn? I know I do, it’s by far my favorite smell AND taste. When I received my vintage collection old fashion popcorn maker from Nostalgia Electrics I was over the top with excitement to make my first batch! The first time making popcorn was very fun and the instructions were VERY easy to understand. 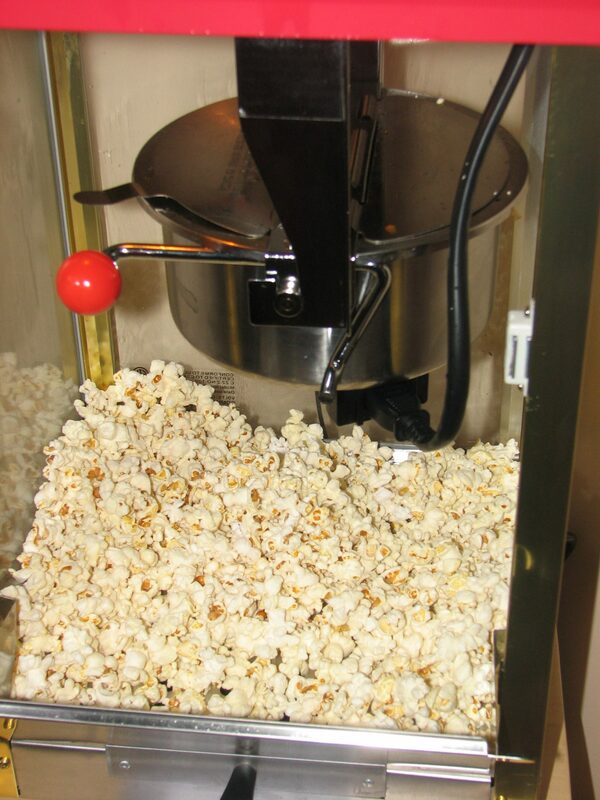 What is great about this Popcorn Maker is that you can also make kettle corn too! With the recipes that come with the machine my family is very excited to try out a few new varieties! The popcorn machine sits beautifully on a old stand in my kitchen. Originally, I was going to have it downstairs in my basement on a popcorn stand, but when I placed it on the stand in the corner of our dining area, I then realized that the popcorn maker had completed my kitchen. I think it gives my kitchen a very classy look! The kettle detaches from the machine to let you clean it out! As well, it’s very easy just to wipe down the windows and the bottom of the machine while the kettle is out of the machine because without the kettle in the machine there is more arm space so you can get right in there to clean it perfectly. It’s a 5 minute tops clean up job! One thing I hate is having kernels in my popcorn. Don’t you? This machine has holes in the bottom so if any kernels do escape, trap at the bottom will catch them. The holes at the bottom are actually very handy when it comes to clean up time too! Just scoop up the left over popcorn and sweep all the tiny bits into the holes! I am so satisfied with this machine. The popcorn tastes is great and clean up time is quick. As long as you have all the ingredients out you can make popcorn in between commercials! I’m not kidding! It takes seconds to do. Popcorn machines isn’t the only thing that Nostalgia Electrics manufactures. They also make cotton candy machines, drink machines, fondue machines and SO MUCH MORE. I own many Nostagia products (including the cotton candy machine) and I have yet to find one that disappoints.